A captivating and inspiring journey, written by Dancing With Palm Trees. It felt peaceful and tranquil to read. She put her hand to the Stone and a million millennia of memories coursed through her soul and out from her pores. She put her hand to every boulder and heard the rocks cry out their praise to Our Creator. 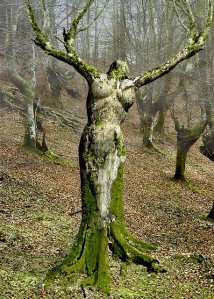 She put her hand to the magnificent Oak Tree and received the voices of streams, rivers, oceans, lakes and streams. She put her hand inside Gaia Mother Earth and heard the calls of sacrifices, bog dwellers, cave peoples, the cries of those murdered all crying out for justice. She extended her hands within the forest absorbed the singings of creatures past and present reverberating within her spirit. Her fingers touched the voices of cave dwellers imbuing their drawings with Life. And in the fullness of time vibrations echoed through the eons.